WellSpan leaders, clinicians and staff are joined by representatives of the York County Economic Alliance to cut the ribbon for the newest WellSpan Urgent Care in West York. The location at the West Manchester Town Center opens to patients Monday, March 18. WellSpan Health clinicians, leaders and staff were joined by the York County Economic Alliance on Friday to officially cut the ribbon at the newest WellSpan Urgent Care center in the West York area. 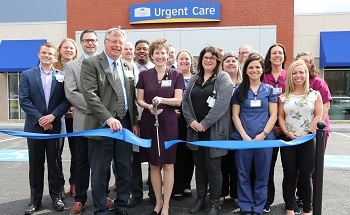 The new WellSpan Urgent Care is located at 717 Town Center Drive at the West Manchester Town Center shopping center, near the West York Walmart. It officially opens on Monday, March 18. Due to the close proximity of WellSpan’s CareExpress in the nearby Delco Shopping Center, that location will close Saturday, March 16. Patients are invited to transition their care to WellSpan Urgent Care for a wider range of services and more expansive hours. The West York location is the fourth WellSpan Urgent Care in York County, and the seventh across southcentral Pennsylvania. Other locations include: East Market Street in York, Hanover, Shrewsbury, Gettysburg, Ephrata and Lititz. All WellSpan Urgent Care locations are open from 8 a.m. to 8 p.m., seven days a week, caring for patients age 3 months and older, who have non-emergency needs, such as minor illnesses and injuries – from sore throats and coughs to sprains, strains and possible fractures. All WellSpan Urgent Care centers offer X-ray services. In addition, all WellSpan Urgent Care centers offer school, camp, college and sports physicals, as well as some routine immunizations. Patients can also take advantage of an online service called “Reserve My Spot,” which allows them to choose a time slot that suits their schedule. This can be done via smartphones, computer, tablets or at an in-person check-in kiosk at the office. For more information, visit WellSpan.org/Urgent.